80 redfish are waiting to be tagged at the FWC/FWRI hatchery! If you snooze, you just might lose (a truck or a boat/trailer/motor)! While the CCA Florida STAR Tournament‘s start is a few months away, it’s time to start thinking about participating. Mark your calendars and be sure to get out on the water as much as you can during the tournament, get the Smartphone APP, and enter as many times as you’d like (1 of each of every saltwater species a day), and hope you catch a winning redfish. And fair warning: don’t be the person who catches a tagged redfish and who forgot to enter! Your 30 bucks will be well-spent! Also, anglers along our Big Bend, which is the coastal part of Natural North Florida, may just have an advantage, as our ratio of anglers to tagged fish might be low. That’s the nice thing about fishing our untouched and lonesome coast!!! 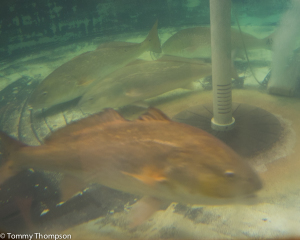 80 specially-tagged redfish will be released along the coast, and catching one may result in winning a boat/motor/trailer package or a new truck. However, you MUST be registered to win!!! Other species of fish will also be eligible for prizes at a drawing at the end of the Tournament. Again, you MUST be registered to win!!! Fish entries will be made by entering photos online of your catch alongside special “law sticks” provided by Florida Sportsman. A smartphone APP will be available in March, easing entry of catches right from your boat. In total, about $500,000 in prizes will be offered at what will be Florida’s largest fishing tournament. Please let me know how to register for this tournement? I also work for Englewood CRA and this would be a flyer to be offered at my office.